When I was in high school we were required to take a semester of communism during our senior year – the idea was to “know the enemy”. That is what we plan to do here… But, the enemy is a microscopic plant. Its name is Karenia brevis. It is one of about 10 species of Karenia found in the ocean but it is the dominant form in the Gulf of Mexico. Karenia is referred to as “phytoplankton”, which suggests it is a microscopic plant. But in fact, it is in the Kingdom Protisita, not Plantae. 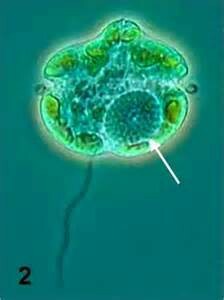 It is “plant-like” in that it has chlorophyll and can produce its own food. It differs in that it is a single cell. They are a type of phytoplankton called “dinoflagellates” because they have two flagella. The next question of course is what is flagella? It is a hair-like structure used by the cells for location. Though they can swim, they cannot out swim a current and so drift in the ocean – using their flagella to move up and down within the current and orient themselves. The cell is covered with a protective shell called a theca, which as grooves, known as girdles, in which the flagella lie – one running east-west, the other north-south. They are between 18-45 microns long with the north-south flagella extending to look like a tail. They are members of the Gulf of Mexico community. Always out there, always have been. Typically, a plankton sample might find 1000 cells / liter. At these concentrations there does not seem to be a problem. The problem is that in its defense, K. brevis will release toxins. The toxin is a cocktail of lipophilic polyether compounds called brevotoxins. At low, or background concentrations, the levels of brevotoxins does not seem to effect marine organisms much at all. However, when the population of cells increases, to say 2 million / liter, fish kills can occur. The state of Florida will close shellfish harvesting if the concentrations reach 5000 / liter. This brevotoxin is pretty strong stuff. It effects the nervous and immune systems, and effects the respiratory system. For marine vertebrates, it is deadly. At concentrations over 1,000,000 cells / liter, it can cause death for fish, dolphins, sea turtles, and manatees. Shellfish are filter feeders. During large blooms of K. brevis shellfish can consume enough to make humans very sick if they consume the shellfish. So what causes their numbers to increase from 1000 to 1,000,000 cells / liter? Though K. brevis is not a plant, it is plant-like. Plants like sunlight and fertilizers. Warm shallow seas of southwest Florida are perfect. Nutrients are available in the environment and growth begins. Most blooms (large growth spurts) occur offshore. They love high salinities and not as common in our estuaries. However, they are plankton – wind and currents can move them closer to shore. During the raining season (summer) run-off from land brings with it nitrogen and phosphorus (nutrients) which can enhance a bloom. The fish kills begin, the respiratory problems for humans are annoying, and the tourist become concerned. Red tide can certainly have an impact on the local economy. Globally, algal blooms seem to be increasing. Red tide can last a few days or a few months, each year varies. These are not exotic species; they are local Gulf residents who are finding warmer, saltier seas that they love. Algal blooms typically occur from September to February and though are common in southwest Florida, can extend across the Gulf to Texas – which the Florida panhandle is experiencing currently. As Dr. Karl Havens mentions in his article attached, we cannot control the weather, but we can control the amount of nutrients we allow into our waterways. We should consider management practices that do just this to reduce the effects of these naturally occurring blooms. Below are other articles from Sea Grant on this topic. About Florida Red Tides. Florida Fish and Wildlife Conservation Commission. http://myfwc.com/research/redtide/general/about/. Indian River Lagoon Species Inventory. Karenia brevis. Smithsonian Marine Station at Ft. Pierce. http://www.sms.si.edu/irlspec/Kareni_brevis.htm. Pierce, R.H., M.S. Henry. 2008. Harmful Algal Toxins of the Florida Red Tide (Karenia brevis): natural chemical stressors in South Florida coastal ecosystems. Ecotoxicology. 17(7). Pp. 623-631. http://www.sms.si.edu/irlspec/Kareni_brevis.htm.